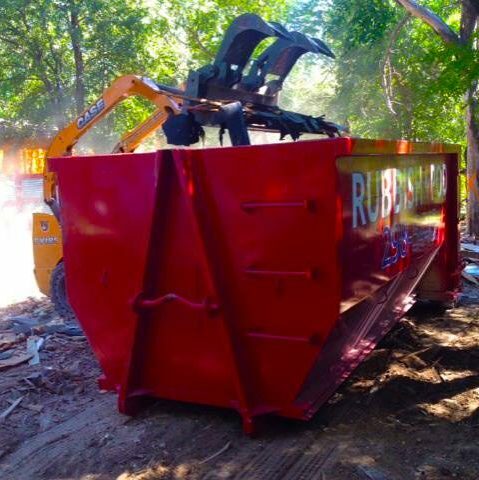 At RUBBISH INC™ we are proud to offer both 10 and 20 yard dumpsters at a flat rate price. Our flat rate price includes: drop off, pick up, and dump fees. Absolutely no hidden fees. ** The above rates include all drop off, pick up and dump fees, for up to 4 tons (8000 lbs) of weight. Additional weight after the first 4 tons is billed at $65 per ton. Traditional rentals aren't for everyone- if you're on a tight schedule, or know you only need a dumpster for a day or two, our new Rapid Rental Program is just what you're looking for. Instead of a standard 7 day agreement, you can get it dropped off on shorter notice as long as you're all done in the three day turnaround period. Call us for our rates 512-298-5445. Ready for a hassle free dumpster rental? It’s happened to us all at one point or another. You were “just going to put a few things in the garage for now” and all of a sudden there’s barely room to walk. You decided to do a “quick weekend remodel” you saw on HGTV—that’s now in month 5—and left a pile of debris in its wake. The decision to save the attic or garage cleanout until you can have a yard sale, only now it’s the last day before moving out... Yeah, we’ve been there too. Give us a call and tell us a little bit about your project. It can be hard to estimate what size you’ll need, but we'll help you get the right fit. Let us know when you need it, where to place it, and when to pick it up. Fill it up at your leisure, and then enjoy your newly spacious yard (or attic, room, garage… etc). 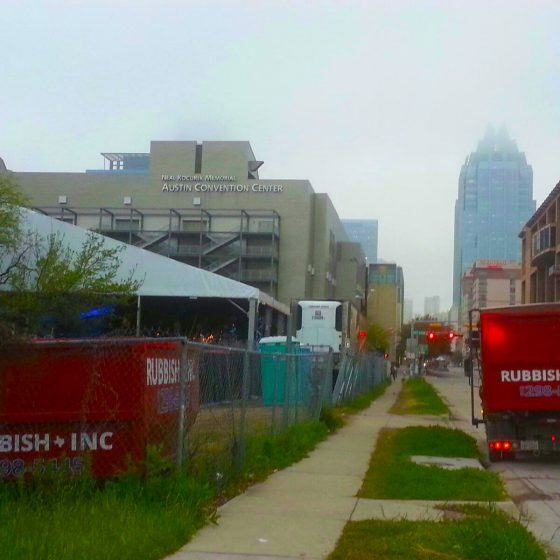 There’s a reason we're the go-to Austin dumpster rental company. 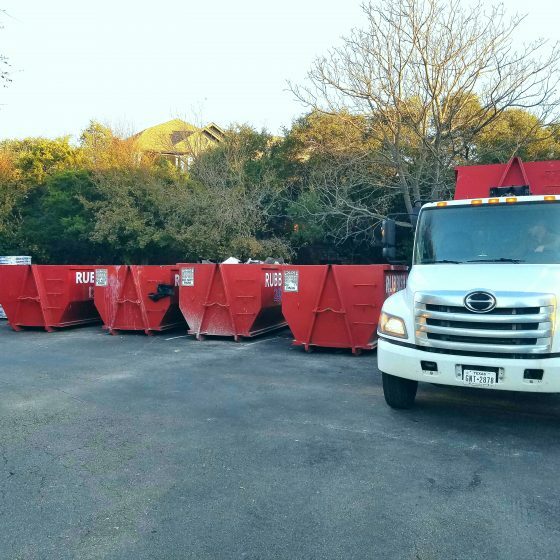 Not only are we the only business in ATX offering dumpster rental AND junk removal, but we believe in customer service above all else—even if we’re just garbage people. 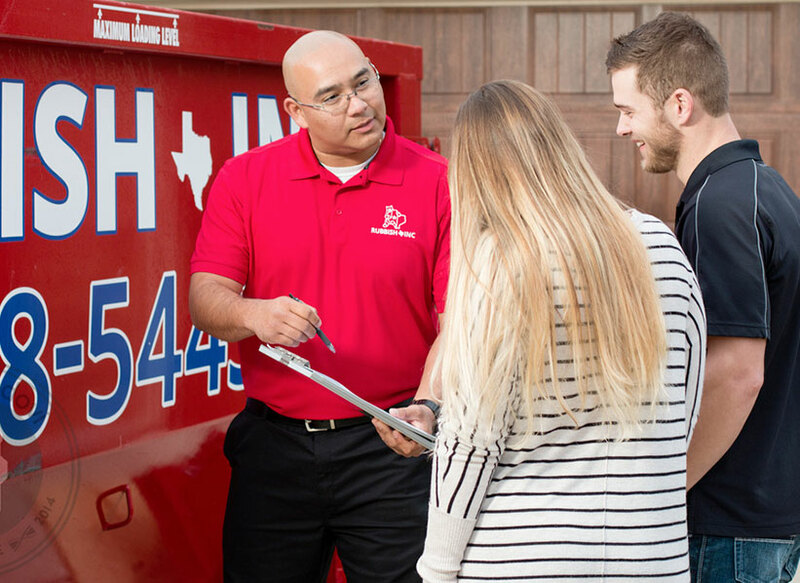 Have questions about dumpster rental? Which Size Dumpster Do You Need? We know projects—and their aftermath—come in all shapes and sizes. For large jobs, we can bring out additional dumpsters, or swap your container out as many times a week—or day— as needed to keep your project on schedule. If you only need a little bit of room, the 10-yard option is perfect for small jobs at home. Just give us a call, we are always happy to help you choose the right size dumpster. 10 Yard Dumpster: Great for small renovations, and small to medium sized clean-outs. If you are getting rid of heavy debris like dirt or concrete, just let us know first. 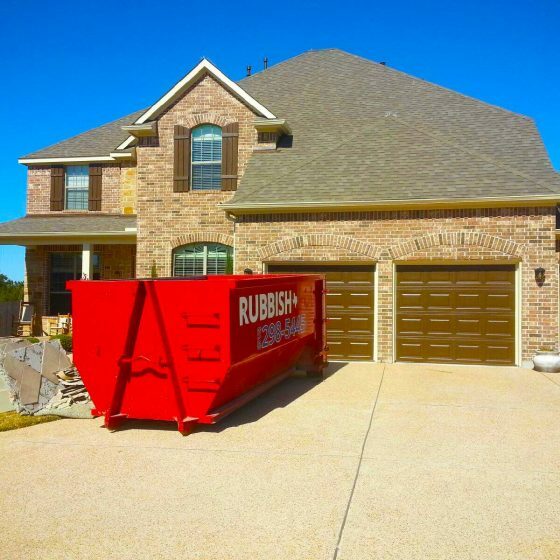 20 Yard Dumpster: Perfect for full scale remodels, full garage or house clean-outs, and large commercial projects. Full-width opening doors allow for easy loading. WHAT’S INCLUDED IN A STANDARD DUMPSTER RENTAL? For pricing outside of central Austin (including Round Rock dumpster rentals and Cedar Park dumpster rentals) please call or email for your area’s rates. Feeling overwhelmed at the thought of filling the whole dumpster yourself? Don’t fret – we also offer junk removal crews who can come out and do the heavy lifting for you! Just tell us where everything’s at, when you need it picked up, and it’ll be gone before you know it. Have an unusual request? Perhaps there’s something you’re not sure you can throw away, or if we’ll take it? Give us a call or drop us an email and we’ll help you figure it all out. It’s been said that there’s no dumb questions, only unasked ones. Well, we’d love to answer your questions! If you can’t find it below, call or email us – just like clean-outs, no question is too big or too small. Are there any additional costs once I receive a quote? Absolutely not! Our knowledgeable staff will ask questions to ascertain your needs, and we stand by our quotes with a simple promise; if you don’t sneak any unacceptable debris and we don’t sneak in any additional fees. That’s a great question! We do not accept hazardous materials including liquids, chemicals, asbestos, paint, gas, oil, and biological/medical waste. Also, we do not accept concrete, gravel, or soil in our standard containers because of the weight; if you need to dispose of any of these please contact our staff to ensure the proper container is quoted and delivered. Will the dumpster damage my property when it’s placed? 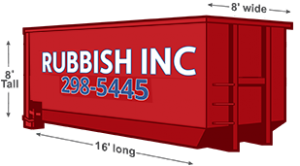 RUBBISH INC™ trucks are designed to gently place your rental container at the location of your choice. Any other typical trash truck comes with a “roll off” hoist system requiring the dumpster to be dragged and pushed on and off the truck, which can lead to permanent damage to your property. Our RUBBISH INC™ hook lift system allows us to set – and never drag – the containers, leaving your property virtually unscathed. Do you load the dumpsters? We sure can! We understand that everyone needs a hand every now and then. Our crews can load your debris pile or heap of construction waste into the dumpster and haul it away. It doesn’t get much easier than that! How much bulk trash can fit in one of the containers? How much garbage ya got? Seriously, though - Each 20 yard container is estimated to hold approximately 6 pickup truck loads of debris. If you run out of room with more cleaning to do, simply give us a call and we guarantee we’ll have you a fresh dumpster out to your jobsite within 24 to 48 hours. Is there a weight limit when filling up the containers? 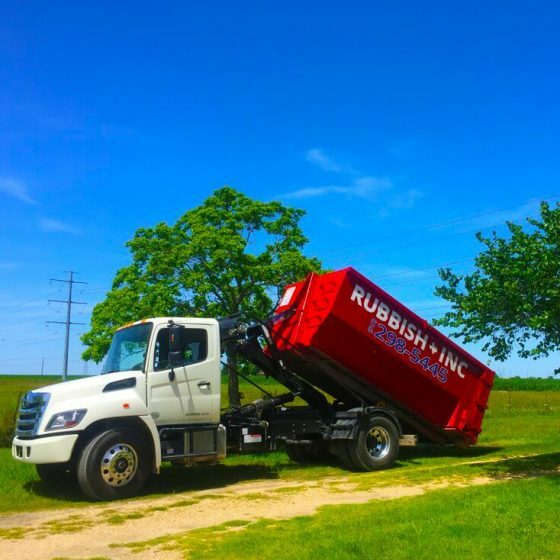 RUBBISH INC™ allows up to 4 tons of debris per dumpster and we can easily arrange to lift and haul over the 4 ton limit at $65 per additional ton. All dumpsters must be leveled off for safety purposes. Please feel free to contact us with any questions or for general estimated load weights (We’re pro’s in this department!). 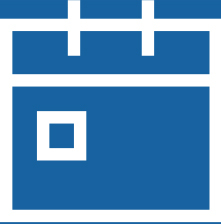 Do I have to be on-site when the container is dropped off? You do not have to be home for the drop off – or even on-site. 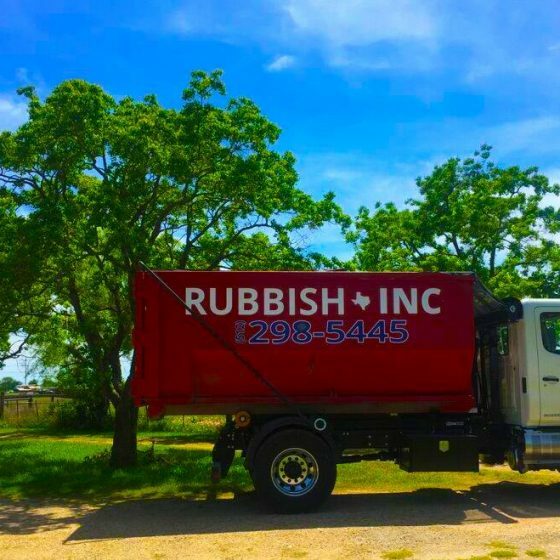 We accept over the phone directions, pictures via email, text, and just about any source of directions that gets your RUBBISH INC™ dumpster to the right spot and allows you to go on about your day. “Left or right hand side of the driveway,” “curbside,” any of these will do, and more detailed explanations are always welcome! If you need the container to go onto a soft or grassy area, please make sure to let our customer service representative know so we can properly prepare the area before drop-off. How long are the container rentals available? Our standard rental periods are anywhere from 30 minutes up to 7 days. If you’d like to keep a dumpster on-site long term, we will schedule it to be swapped for an empty once every 10 days. Sometimes you find yourself behind or ahead of schedule – if you think you’re going to need an extra day or two, or maybe you’ve finished the job several days early, please give us a call or shoot us an email.